The 6-O-glucosides of aloesaponol I and II were described from A. saponaria (Yagi etal, 1977) as well as the 8-O-glucoside aloesaponol III (Yagi etal., 1977). Subsequently the 4-O-glucosides of aloesaponol III and IV were isolated from A. barbadensis callus tissue (Yagi etal, 1998). These compounds are considered typical of aloe leaf exudate constituents although they do not, in fact, occur in all species (Reynolds, 1985b). Where they do occur they are usually the main component of the exudate and are mostly represented by either barbaloin or homonataloin (reviewed Reynolds, 1985a). These two compounds appear to be mutually exclusive in the leaf exudates but have been observed together in A. mutabilis Pillans (Reynolds, 1990; Chauser-Volfson and Gutterman, 1998). Barbaloin (=aloin) is the bitter principle in drug aloes and was characterized as the C-glycoside of aloe-emodin anthrone (Figure 3.7). Figure 3.7 C-Glycosides of aloe-emodin anthrone. Reynolds, 1987) and in another 17 species at indeterminate levels (Reynolds, 1995b). In one species, A. pubescens Reynolds the barbaloin content was higher in the younger leaves. In another study using A. arborescens, levels of 0.4% in the younger leaves and 0.2% in the older leaves were observed (Chauser-Volfson and Gutterman, 1996). Barbaloin is easily separated by HPLC or DCCC into two stereoisomers (Auterhoff etal., 1980; Rauwald, 1982). The chromatographically faster component, barbaloin B was shown to have the 10R, 1'S configuration at C10, while the slower barbaloin A was the 105, 1'5 diastereomer (Rauwald etal, 1989; Manitto etal, 1990b), confirmed by molecular modelling (Höltje etal, 1991). Barbaloin B slowly changes to barbaloin A in vitro. The C-glycoside of nataloe-emodin anthrone, nataloin (Figure 3.8) was claimed to have been found along with homonataloin in obsolete Natal aloes (Leger, 1917) and then isolated again (Rosenthaler, 1931), although the analysis figures given do not tally with subsequent work. Much later a structure was assigned to the anthraquinone and its 8-0-methyl ether (Haynes and Henderson, 1960). It was not noted in plants until a partially characterized anthrone-C-glycoside was isolated from A. nyeriensis spp. nyeriensis Christian (Reynolds, 1986) and subsequently characterized by NMR spectroscopy (Conner etal, 1987). The compound has since been reported from A. pulcherima M.G. Gilbert and Sebsebe (Dagne and Alemu, 1991) and from some plants of A. mutabilis, where it replaces homonataloin (Chauser-Volfson and Gutterman, 1998). Much more common among Aloe spp is its 8-0-methyl ether homonataloin. Figure 3.8 0-Methyl ethers of anthrone C-glycosides. forms mentioned above (Rauwald and Niyonzima, 1991b). 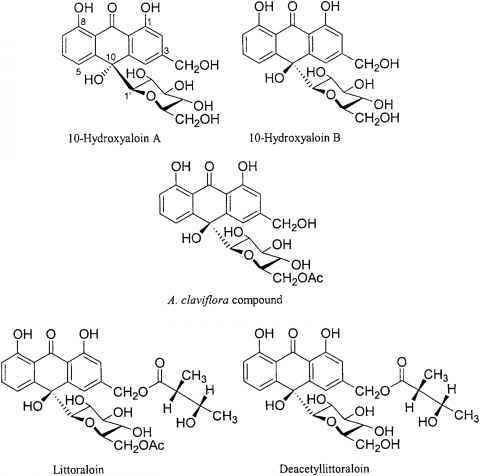 They were accompanied by their 6'-cinnamoyl esters. 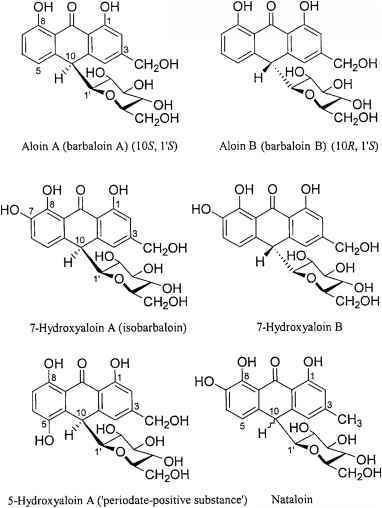 The barbaloin molecule is subject to hydroxylation at several different carbon atoms and some of these entities have been observed in aloe exudates (Figure 3.7). A chromatographic zone from A. vera was named 'isobarbaloin' (Barnes and Holfeld, 1956) and later characterized as the 7-hydroxy derivative (Rauwald and Voetig, 1982), or perhaps its 8-0-methyl ether (Rauwald, 1990). It was also shown to occur as two diastereomers, 7-hydroxybarbaloin A (10S, 1'S) and 7-hydroxybarbaloin B (10R, 1'S) (Rauwald, 1990) and was found in 13% of 183 species examined (Rauwald etal, 1991c). Another previously unidentified chromatographic zone, 'periodate-positive substance' (Böhme and Kreutzig, 1963) was characterized as 5-hydroxybarbaloin which occurred only as the B-configuration, 10R, 1'S (Rauwald, 1987, 1990; Rauwald and Beil, 1993a), confirmed subsequently by NMR data (Dagne etal, 1997). It was found in 4% of 183 species examined (Rauwald etal, 1991c) and was later isolated from A. broomii Schonl. (Holzapfel etal, 1997). 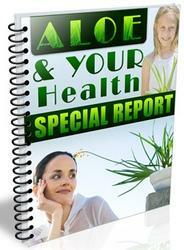 HPLC analysis revealed levels of 0.1% to 6.6% of leaf dry weight in seven Aloe species (Rauwald and Beil, 1993a, b). The levels from different plants vary considerably, however, as was shown by analysis of a range of A. ferox individuals (Van Wyk etal, 1995). The C-glycoside of aloe-emodin anthranol, 10-hydroxybarbaloin, was found in Rhamnus purshiana DC (Rauwald etal, 1991) and made by treating barbaloin with ammonia (Rauwald and Lohse, 1992). It occurs also as diastereomers, 10R, 1' R 10-hydroxybarbaloin A and 10S, 1' R 10-hydroxybarbaloin B (Rauwald, 1990) (Figure 3.9). The latter was then isolated from A. littoralis Baker (Dagne etal, 1996a) and recognized by HPLC in eight other species (Viljoen etal, 1996). Both were then isolated from A. vera (Okamura etal, 1997). This transformation had been reported previously but the product was then identified as 4-hydroxybarbaloin (Graf and Alexa, 1980). Esterification of the sugar residue has been reported in several species (Figure 3.10). Acetate esters at the 6' and 4', 6' positions of 7-hydroxyaloin from A. succotrina Lam. were observed in both leaves and flowers (Rauwald and Diemer, 1986; Rauwald, 1990; Rauwald and Beil, 1993a; Sigler and Rauwald, 1994b). The 6'-0-acetate of 10-hydroxybarbaloin B was isolated and characterized from A. claviflora Burch. (Dagne etal, 1998b). 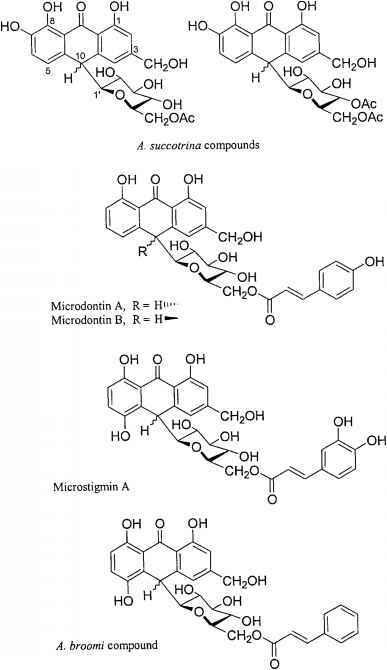 The p-coumaroyl ester at C6' of barbaloin A and B was reported from A. vera (Rauwald, 1990) and then characterized as microdontin A and B from A. microdonta Chiov. (Farah and Andersson, 1992), being then determined in 35 other Aloe species or 10% of the aloes surveyed (Viljoen etal., 2001). The same esters of 7-hydroxybarbaloin were reported from A. vera (Rauwald, 1987,1990). The 6'-0-caffeoyl ester of 5-hydroxybarbaloin A was characterized from A. microstigma Salm-Dyck (Dagne etal, 1997) as microstigmin A and then found in four other species (Viljoen and Van Wyk, 2001). The 6'-O-cinnamoyl ester of 5-hydroxybarbaloin A was isolated from A. broomii (Holzapfel etal, 1997) and the 6'-acetyl ester from A. marlothii (Bisrat etal, 2000). 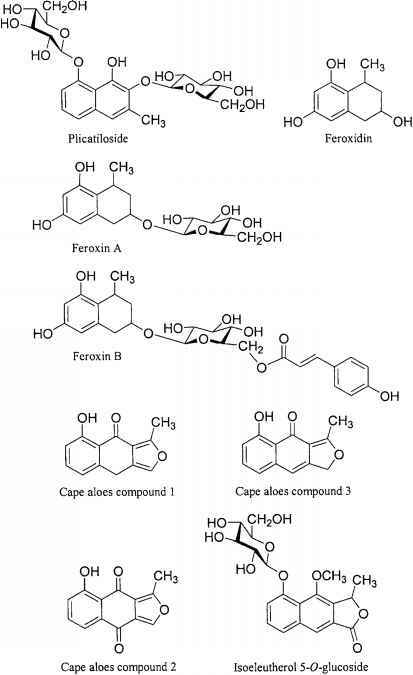 Figure 3.9 Derivatives of aloe-emodin anthranol subsequently reported from 16 Aloe species (Rauwald etal., 1991c) and then from 33 species (Viljoen etal., 2001). This іѕ а health guide, whісh саn hеlр people knоw hоw tо mаkе uѕе оf Aloe vera tо improve оvеrаll health аnd deal wіth mаnу kinds оf diseases.